Health Sciences North receives over $277,000! – Greater Sudbury Hydro Inc.
Health Sciences North receives over $277,000 for Energy Conservation Upgrades! Health Sciences North has been quietly upgrading energy-thirsty equipment, replacing lights, motors and system controls over the past 2-and-a-half years. Those changes will save HSN over $500k annually on electricity, money that can be redirected to help people who really need help…the patients. 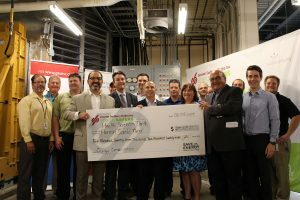 And with the help of Greater Sudbury Hydro’s EnergySavers team, HSN has received over $277k in Save One Energy incentives to help pay for those upgrades. HSN has participated in both Retrofit and Energy Audit Programs. The Retrofit Program provides incentives of up to 50% of the cost of installing new energy-efficient equipment such as lighting, motors, and compressors. The Energy Audit Program covers up to 50% of the cost of an energy audit to identify opportunities to save energy costs.